Through community partnership, the Water Initiative seeks to increase sustainable access to clean water in Chermaitre. 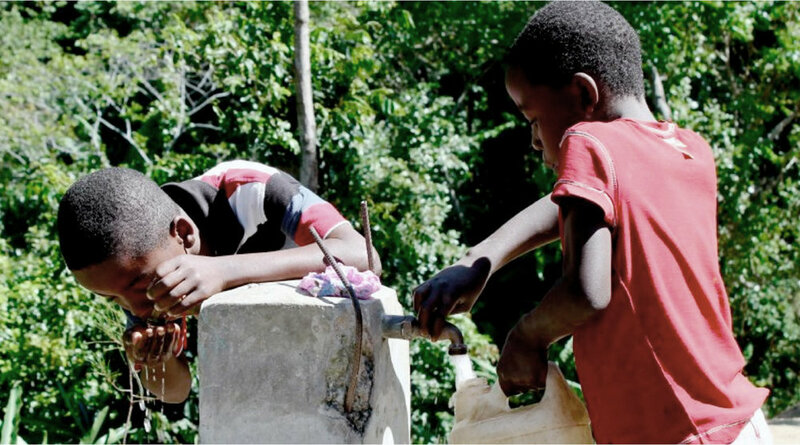 Access to clean water is a pressing concern in Haiti, where water-borne diseases such as typhoid, cholera, and intestinal parasites account for over half of all deaths in the country each year. Contaminated water also contributes to heightened child and infant mortality rates. Vassar Haiti Project’s Water Initiative began in 2010 after VHP’s March trip to Chermaitre. After learning of the long distances traveled to obtain water, VHP worked to install a faucet in the village schoolyard where water could be accessed more easily. Local engineers were hired to install a gravity-driven water access system with 3 cisterns and a main faucet located at the school. The system was installed to bring water from the spring around 20 minutes up the mountain from the school yard. After the installation, people in Chermaitre have been free to draw water from the school faucet at any time. However, some families still travel over an hour to reach water, and we hope to eventually ensure each family has a water source within a 30-minute radius from their home by expanding the cistern system. The Vassar Haiti Project is continuing to purify and improve water accessibility in Chermaitre and the medical center in Fiervil. In 2016, through the generosity and collaboration with the Poughkeepsie-Arlington Rotary Club and the Peekskill Rotary Club (Districts 7210 and 7230), we were able to secure a $54,000 grant to purify the water. The project is dedicated to the memory of Tanshukh Dorawal, who guided and counseled the VHP to focusing on water issues in the region. Our partner, Pere Wildaine started the Memorial des Gonaives Rotary Club in Haiti who helps us oversee the projects as they progress. Target date for finishing the project is December, 2018 which includes the education of the local people on the importance of clean water. Our long term goal is to complete the water purification system, complete with a plan of sustainable maintenance, within the next two years. We also hope to provide families that live considerably farther from the water purification system with portable water purifiers.